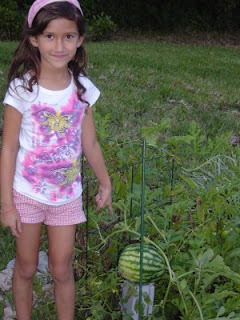 When my oldest daughter was a baby we had our first small garden of cherry tomatoes, cucumbers, radishes, and okra. My husband grew up in India where his family had a large garden and was surprised at how much the soil in Florida is lacking in nutrients. According to him, in his small town in India, you could "put any seed in the ground and it would grow without manure or fertilizer". We took a 3 year hiatus from gardening and just started back up again this year, mostly out of necessity. With rising food prices and a cut in my husband's salary, we decided it was time to get the garden started again. Now that we are in a different home with a larger backyard, we could potentially have a large enough garden that could supply us with more than 50% of our fruits and veggies! Already we are harvesting romaine lettuce, spinach, tomatoes, banana peppers, cherry tomatoes, okra, and pretty soon- watermelon!